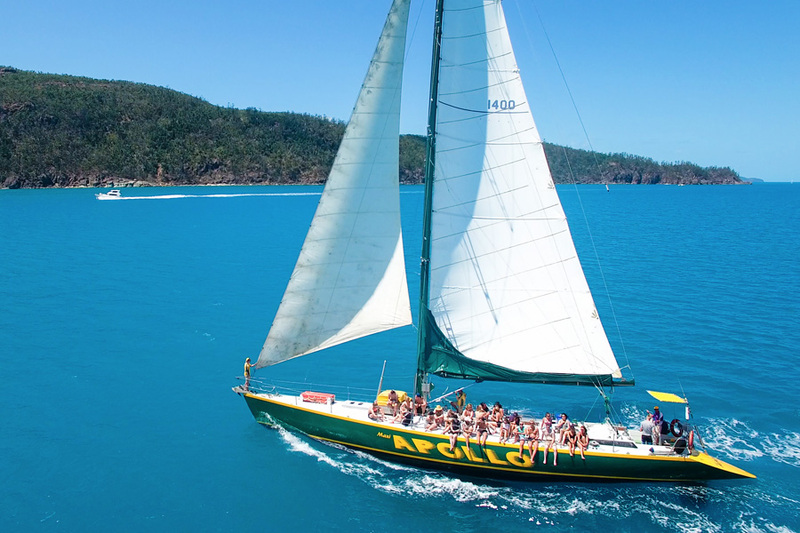 See and experience the Whitsundays while onboard your 3 day/ 2 night adventure on Apollo. Ideal for backpackers and those who aged between 18-30 with a need for fast, hard sailing. From day 1, the journey will begin at Abell Point Marina where Apollo will take off on a quick trip to the northern part of the famous Whitsunday islands. This is your opportunity to take in the beautiful region and underwater world at Luncheon Bay or Blue Pearl Bay. Why not take up the offer of your FREE dive for both introductory and certified divers (subject to medical and conditions). Apollo is a full service dive vessel, with all equipment on board. And, night dives are conducted on both nights for certified divers and again are a trip highlight. Explore the top destinations of the Whitsundays while on this great 2 day/2 night Apollo adventure! The best way to explore the islands of the Whitsundays is by scuba diving. The region features beautiful reefs, hundreds of different types of corals and thousands of different fish species as well as other marine life, including turtles, dolphins, dugongs, sharks (the friendly ones!) and even manta rays. Apollo offers the first dive for free, but we are sure you will want to get back in to see more. Please note conditions apply for diving, see the more information section for more details. An early start will give you more time for more snorkeling and diving at another amazing coral cove. After breakfast you are ready to get involved in the sailing and feel like a real racing team. Apollo is fully rigged to ensure you get a sense of what its really like to be on board a Maxi yacht, being pushed to the edge of the wind. Find yourself in the midst of a race with other Maxis... a truly one time experience. All Dietary requirements can be catered for but may incur an additional fee. Vegetarian $5.00 surcharge. Please advise when booking. Please only bring a small soft overnight bag without any zippers (ie. a re-usable shopping). Ensure you pack clothes, a hat, swim-wear, beach towel, sunscreen 30+, warm pullover for the evenings (seasonal)and cash/card for on board purchases. Please feel free to bring on board a reusable water bottle and/or additional snacks. You will also need to bring your own alcoholic beverages, available for purchase in town. No glass bottles please. Please note check in is at 8:00am at South Marina Tour Departure Point . BYO drinks/alcohol (no glass). Scuba diving (after the first FREE experience) is an additional cost - all diving can be decided on and paid for on board. Your safety in the water is our primary concern. To ensure your comfort and safety divers must be 18 years or over and they will require that you have a Divers Medical Certificate for certain medical conditions or if over 45 years old. Are you over 45 and do you have a family history of heart attack or stroke? Most dietary requirements can be catered for but may incur an additional fee of $10.00. Please advise when booking.